I saw this picture and just loved it. As it came from Instagram with no real source, I could not find a better quality to it, but I thought that you would all appreciate it as it really shows just how different soles can be. 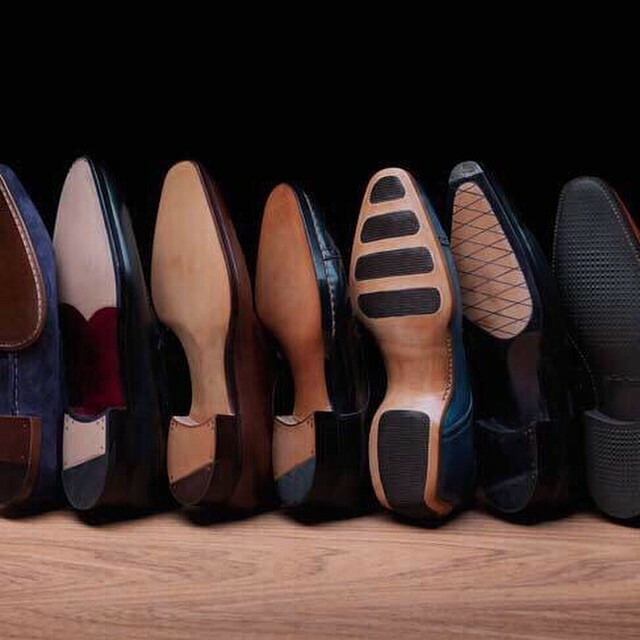 These ones are all by Stefano Bemer and really reminded me of my time there and my inspecting of every shoe there was in the showroom. The rubber sole on the right is probably the hardest wearing sole I have ever encountered. I must have put about 500 miles on that thing (no joke, I used to walk a minimum of about 4 miles a day for 10 months while living in Florence…). But my favorite one was the one with the black waist and the criss-cross oval in the forefoot. So cool! Anyway, each sole has a soul, or at last was created by someone else’s soul and I always appreciate seeing the different ideas that people come up with to cover the most worn part of the shoe. Maybe you will now start to enjoy them as much as I do?….. The 3rd from the right looks interesting.. any idea what it is ? thanks for that….I should have looked there!! Justin could you explain how a rubber sole is attached to a good year welted shoe please? Is it a different process to that of a traditional leather soled shoe? I need a pair of rubber soled shoes, but don’t want to pay to dollar for a rubber soled shoe which is compromised in terms of build quality. Why is a rubber soled shoe compromised in terms of build quality? If the rubber sole is welted, what’s the compromise?